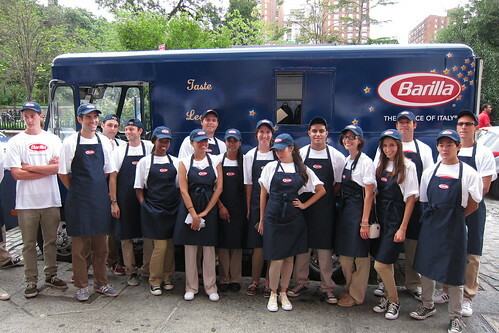 Yesterday afternoon, Barilla launched its "A Meal for a Meal" truck as part of their Summer of Italy program! 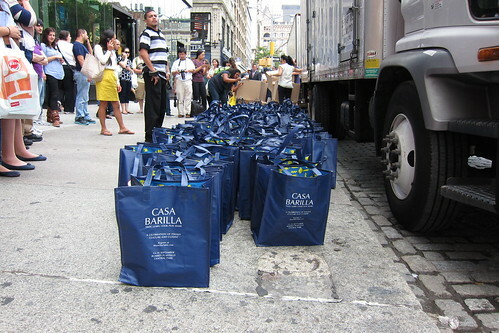 Not only are they going to be handing out 5,000 bags filled with spaghetti, sauce, and salad every day until Thursday, they also include two tickets to Barilla's Casa Barilla, a Central Park pop-up happening in September. 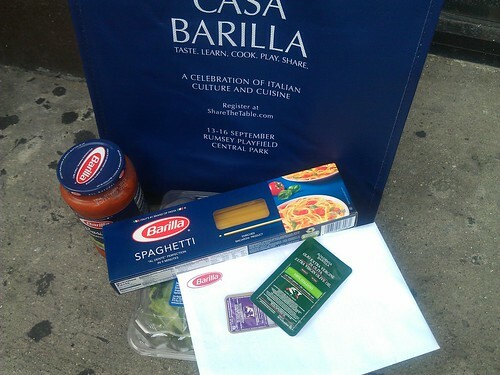 But the free stuff isn't even the best part, for every meal carried away, Barilla's donating $1 to the Food Bank for New York City. It's a double win. As a brand ambassador, I got to stop by early and watch the team get ready for their first day on the streets. 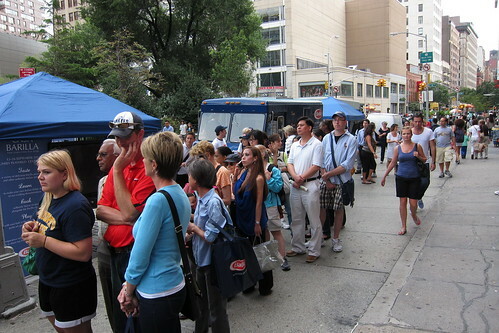 Yesterday, they were located on Union Square West between 14th and 15th Streets, and they had a line of onlookers long before the 4pm start time. Barilla's one of the best brands of dry pasta on the market, so I can't say I blame anyone for waiting around for a free dinner! This group of bags was gone within minutes! As bags were being dispersed, I was reminded that for every picture uploaded to Barilla US's Facebook, they'll donate another $1 to Feeding America! So, if you stop by the truck in the next few days, say YES to the man with the camera. You're photo will be uploaded to Facebook, and you'll help feed another five people! The truck is scheduled to be at Penn Station on 7th Avenue between 31st and 32nd Streets tomorrow today, at East 59th Street between Lexington and Third Avenue on Wednesday, and on Broadway between 58th Street and Columbus Circle on Thursday. The handouts don't begin until 4 o'clock each day and will go on until the day's 5,000 meals are gone. I'm not sure what I'm making with my pasta yet! Full disclosure: I visited this truck on behalf of Barilla. I am a sponsored and compensated Brand Ambassador for their Summer of Italy initiative. they're at Penn Station today, correct? Yes, today at Penn Station. Sorry and thanks! More New Flavors at Van Leeuwen! CoolHaus Ice Cream Sandwiches are Now $6?! I'm a Barilla Brand Ambassador!